Breadfruit is a tremendously productive food plant, producing heavy crops of starchy fruits that are roughly the equivalent of a potato that grows on a tree. Breadfruit grows throughout the lowland areas of the wet tropics. It is fairly cold sensitive, and does not like to even get close to the freezing point. In Florida, for many years breadfruit trees were restricted to the Keys, the island chain off the southern part of the peninsula where winter low temperatures are buffered by the surrounding water. In recent years, a string of mild winters has enabled breadfruit trees to produce fruit in the southeastern part of the peninsula. Breadfruit is native to Southeast Asia. It was one of the “canoe plants” which the Polynesians carried with them as they colonized islands across the Pacific. Some forms of breadfruit are seedless; some have seeds which are edible when cooked, resembling chestnuts in flavor and texture. Fruits are 8-11cm (3-4 inches) in diameter, with a spiky shell surrounding bulbs of intensely red-colored flesh around the seeds. People report the flavor is excellent, very sweet, tasting a bit like baked pumpkin. Very tropical, only grows in the lowland equatorial tropics, cannot survive temperatures below 50 F (10C). Jackfruit is one of my favorite fruits, with an aroma and flavor that are just crazy-tropical. If you’ve never eaten jackfruit before, it’s a sensory-overload kind of fruit, an amazing symphony of aromas and flavors. Jackfruit is the world’s largest fruit that grows on a tree. A single jackfruit can weigh as much as 35 kilograms (80 pounds). Since tree branches might break under the weight of such a load, jackfruits often grow right out of the trunk of the tree. Inside a jackfruit there’s a central core, surrounded by seeds, with each seed encased in a jacket of flesh – those jackets of flesh are the edible part. There are also stringy fibrous tissues running between the jackets of flesh, collectively called the “rag”. In some varieties, the rag is stringy and inedible, in others it’s sweet, fleshy, and delicious. Jackfruit trees vary considerably in the flavors of fruit they produce. The fruits from my friend Michael’s jackfruit tree taste like an orange creamsicle. Seriously. This is one amazing intensely-flavored jackfruit, combining jackfruit’s usual symphony of tropical aromas & flavors with a powerful citrusy-orange taste, balanced on top of a rich, cream-like texture. This is one of those jackfruits where not only are the jackets of flesh around the seeds deliciously edible, but so is the rag, the strings of flesh between those jackets of flesh. (Although the rag is still kind of fibrous, and I spit out the fibrous bits once I’ve sucked all the wonderful orange-cream flesh off them.) I had an indirect role in this tree’s origin. In 2006, my friend Ish was visiting Florida, and he asked me where he could go to taste tropical fruits. I told him the same thing I tell everyone: “Go to the Fruit and Spice Park!” This is a public park in Homestead, FL, which has 37 acres of all-you-can-eat tropical fruits, including 150 varieties of mangos. The rules there are simple: you can’t pick fruit off the trees or take fruit out of the park, but any fruits you find fallen off the trees are fair game to gorge on. Well, Ish came back from Fruit & Spice mind-blown, and with pockets full of seeds from the fruits he’d eaten, including seeds from some of Fruit & Spice’s elite cultivars of jackfruit. He gave one of those jackfruit seeds to our mutual friend Michael, who planted it in his parents’ yard, where it grew it into the amazing tree which made the fruit in the picture. I think there are lessons in this story: 1.) Find the best varieties of fruit trees, and propagate more trees from them. 2.) Plant fruit trees as part of the ‘human-scape’, not just on farms. 3.) Talk about fruit. A lot. You never know what seeds might sprout from an offhand comment you make to someone about where to find the best fruit tree varieties. If you live outside the tropics and want to try jackfruit, check your local Asian food stores. Rare fruit hunter Fit Shortie found this gem in a small town in Belgium, at a Pakastani food store. It’s possible to make a fantastic jackfruit-flavored soft-serve ice cream, from nothing but jackfruit. Just freeze the jackfruit segments, and run them through a Champion juicer. That machine gives the resulting “nice cream” the most amazingly rich, creamy mouth-feel, featuring the full jackfruit flavor explosion with no added oils at all. This technique also works great with mango, banana, and mamey sapote. We had a tropical fruit “nice cream” party, where my friend Michael made dairy-free, oil-free, soft-serve ice cream out of jackfruit, “Rajapuri” and “Mysore” bananas (two top-quality dessert banana varieties), and a fantastic variety of mango that he’s calling “Antigua”. I almost couldn’t handle all the deliciousness – we were all floating on a tropical fruit high for hours after eating all that. Chefs and restauranteurs take notice: serve this, and you will have many happy repeat customers. Kwai muk is one of the smaller-fruited members of the Artocarpus genus, with fruits about 1 to inches (2.5 – 5 cm) in diameter. Kwai muk fruits reportedly vary considerably from one tree to another, with some trees producing excellent fruit. I’ve only had them from one tree, which had a creamy flavor and a pleasant, strawberry-like flavor. I’ve heard other people report detecting flavors in kwai muk that remind them of mango, apricot, jackfruit, grapefuit, fig, and guava. The tree is somewhat smaller than many of its Artocarpus cousins, reaching about 15-25 feet (5 – 8 m) tall. The tree reportedly can handle light frosts, unlike many of the members of this genus, which don’t like temperatures that get anywhere close to freezing. Good champedak is rated among the world’s best fruits, according to people who have tasted this rare fruit, which is native to Southeast Asia. Apparently there are mediocre varieties of champedak out there, but people report that the best ones have durian-like flavors and aromas, a creamy texture, and are super-sweet. Some of the flavors people report detecting are orange sherbet, bubble gum and salted caramel. Champadak is a cousin of jackfruit with roughly the same fruit structure – a central core, surrounded by seeds encased in jackets of sweet edible flesh, with a rough-skinned rind surrounding the whole thing. The rind appears more loosely attached than in jackfruit, and people usually peel off the rind to expose the edible portion within. Champajack is a hybrid between two great fruits – champedak (Artocarpus integer) and jackfruit (Artocarpus heterophylla). Taste reportedly is phenomenal. Photo by Fit Shortie. There is a lot of variation from tree to tree among champedaks. Some have flesh that’s whitish-yellow, while in some the flesh is closer to orange in color. Champadak trees are more cold-sensitive than jackfruit trees, thriving only in rainy equatorial climates. This is another big Artocarpus fruit packed with sweet fruity-tasting pods of flesh around the seeds. The best cultivars reportedly taste like vanilla lime marshmallows with a hint of tangerine, and a soft texture that dissolves on the tongue. Other flavors people report are banana, melon, and cinnamon. Called tarap in Borneo, marang in the Philippines, this is a powerfully scented fruit. Some forms smell pleasant (at least to exotic fruit lovers), while in other forms of marang the smell is unpleasant, reminding people of the smell of diesel fuel. Reportedly the best forms of this species grow on the island of Mindanao, in the southern Philippines. Marang is an ultra-tropical tree, thriving only in rainy lowland areas near the equator. It doesn’t like temperatures that dip anywhere close to frost. Pedalai (Artocarpus sericicarpus) has been described as “the Holy Grail of Borneo fruits” for its outstanding eating qualities. Photo by Fit Shortie. Pedalai is another Artocarpus with a bumpy, knobby rind, underneath which jackets of sweet flesh surround the seeds. Fruits are around 15 cm (6 inches) in diameter, turning orange when ripe, and sometimes with fibrous projections from the rind that can give it the appearance of a giant rambutan fruit. Unlike marang, the fruits have little aroma. The seeds of pedalai, like other Artocarpus, are edible when cooked – reportedly after a brief frying in oil, they taste like peanuts. There’s nothing like the taste of a fresh fig. If the only figs you’ve eaten are dried, or the pasty filling in a Fig Newton, do yourself a favor: go find yourself some luscious, ripe, yummy fresh figs to eat, just for the experience. 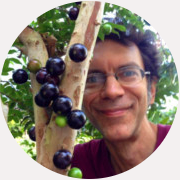 If you live in a climate zone where fig trees grow, try to find a place where you can eat them straight off the tree (like I’m doing in this pic), or get some at a farmers market. If you’re outside of fig country, watch your produce department for imported figs. Even if you’re in an area with icy cold winters, there’s a chance someone might have a fig tree around and will share some fresh fruits with you. The Italian gardeners of New York and Chicago are legendary for the heroic efforts they go through to protect their fig trees, even burying the trees in a trench each winter and raising them out of the ground each spring. Yes, fresh figs are THAT good! If you harvest figs off the tree, be aware that the best figs can sometimes look to a novice like they’re a little past-peak. Slight cracks develop on the skin of some varieties, and the fruit droops slightly – those are the signs that a fig is at the peak of delicious ripeness. In this picture, the fruit on the left is fully ripe and ready to eat, while the one on the right has about another day to go to reach peak ripeness. Figs belong to one of the ‘royal families’ of fruit, the mulberry family, or Moraceae (‘more-AY-suh-ee’). l looked up the health benefits of figs – looks like they’re yet another fruit that’s loaded with health-promoting antioxidants. And here’s something really interesting: researchers who tested six different varieties of fig confirmed something I’d suspected: the darker varieties of fig have higher levels of antioxidants. “Color appearance of fig extract correlated well with total polyphenols, flavonoids, anthocyanins, and antioxidant capacity. Extracts of darker varieties showed higher contents of phytochemicals compared to lighter colored varieties.” Whoo-hoo! I’ve been trying to collect dark-purple fruited varieties of fig, looks like I’m on the right track with that. One of the main antioxidants in figs is antirrhinin, the highly-touted nutrient that’s also present in acai and black currants. If you needed another reason to eat lots and lots of delicious figs, here it is. Figs are more than just delicious – they may have been the first crop humans ever cultivated. Archaeologists have discovered the remains of an apparently domesticated form of fig at a site from 9300 BC. That’s a thousand years before the domestication of wheat, barley, and peas, which are usually considered humans’ first crops. 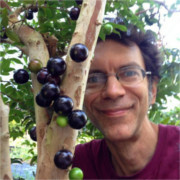 This is kind of a big deal, because it means that maybe, just maybe, fig trees were a key species that started humans on the road to civilization, when we transitioned from nomadic hunter-gatherers to living in settled villages, where we could eventually develop iron-smelting and cars and refrigerators and smartphones. It’s fig season right now – go get yourself some yummy fresh figs today, and say a little thank-you to this fruit species that we owe so much to. Mulberries are sweet and delicious, and this is fruit with one of the widest distributions of any that I know of: there are forms of mulberries that will grow in climates all the way from the equatorial tropics to regions with snowy, cold winters. Packed with healthful anthocyanin pigments, mulberries are something we should eat lots and lots of. Not only do anthocyanins prevent cancer and inflammation, one study found that mulberry anthocyanin extracts prevented the development of diabetes in animals prone to the disease. Finding very early and late varieties is something where a group effort can benefit us all, so we can all enjoy the longest possible season of anthocyanin-packed mulberries. Do you know of any especially early or late-fruiting mulberry trees? “Himalayan” is the best-tasting mulberry I’ve ever eaten (and I’ve eaten a lot of really tasty mulberries). The berries are three inches (7.5cm) long – the same dimensions as my pinky finger. It’s a funny thing: in the US, many people have never eaten a mulberry, and only know this fruit from a nursery rhyme about a ‘mulberry bush’. Which is a crazy situation, because this is a delicious, productive fruit tree (not a bush) that’s super-easy to grow over most of the US. Kids and adults love eating these fruits. Back in the spring of 2004, my friends and I found a mulberry tree growing in Gainesville, loaded with an incredibly abundant crop of big, flavorful berries. The tree made similar crops in subsequent years, and was clearly a superior fruiting variety. We started propagating plants by rooting cuttings from this tree, and we distributed the young mulberry trees at farmers markets and festivals through our volunteer group, the Edible Plant Project (along with many other food-producing plants). The original mulberry tree was growing on NW Sixth Street in Gainesville, so we named the variety “Sixth Street” mulberry. As a result of our efforts, there are now many hundreds, possibly over a thousand, “Sixth Street” mulberry trees fruiting all over the southeastern United States every spring. That’s how it works: find superior varieties of fruit trees, propagate them, and distribute.